This past week, I had the opportunity of attending BYU Women’s Conference. My mom and sister and I try to go every year! We love it! There are many classes to choose from to help you with whatever you are going through at that time. The month of April had been a very difficult month for me. Each of my children have come to this earth with their own unique problems and challenges. It has been a struggle for me as a mother to know what my role is and how to best help my children. All my life, I’ve wanted nothing more than to be a wife and mother. That blessing was given to me pretty early on in my life and for the most part, I have loved being a mother. But as my children have gotten older, different challenges have presented themselves that neither my husband nor I ever saw ourselves dealing with. I am often asked to describe the experience of raising a child with a disability - to try to help people who have not shared that unique experience to understand it, to imagine how it would feel. It’s like this…. When you’re going to have a baby, it’s like planning a fabulous vacation trip - to Italy. You buy a bunch of guide books and make your wonderful plans. The Coliseum. The Michelangelo David. The gondolas in Venice. You may learn some handy phrases in Italian. It’s all very exciting. "But there’s been a change in the flight plan. They’ve landed in Holland and there you must stay. The important thing is that they haven’t take you to a horrible, disgusting, filthy place, full of pestilence, famine and disease. It’s just a different place. It’s just a different place. It’s slower-paced than Italy, less flashy than Italy. But after you’ve been there for a while and you catch your breath, you look around … and you begin to notice that Holland has windmills … and Holland has tulips. Holland even has Rembrandts. And the pain of that will never, ever, ever, ever, go away … because the loss of that dream is a very very significant loss. But … if you spend your life mourning the fact that you didn’t get to Italy, you may never be free to enjoy the very special, the very lovely things … about Holland. I still can’t read this story without tears streaming down my face. Yes! This is exactly how I feel. I may not have teenagers who keep me busy running around to their dance and gymnastic and sporting events. I don’t have daughters who play musical instruments or love to sing. I wasn’t blessed to have daughters who are leaders or love being around people. These are all things I imagined my life would be like. But instead, we spend a lot of time at doctors offices and keeping our house quiet. We have spent countless hours crying and staying up all night worrying about our children and their futures. Taking two cars to places instead of one because someone might have a panic attack from the noisy car is typical in our family. Family dinners are a bit of a joke in our house because of all the eating issues my children have. Avoiding church functions because we are a little bit embarrassed that our whole family can’t be there and someone might ask us where our daughter is. Because a lot of our struggles are mental and emotional challenges with our children, it’s not so obvious to the outside world. It’s hard to not feel judged. There’s times I want to cry from the rooftop about all of our problems so that other parents will understand why my children aren’t at church or why they don’t participate in school functions or why they aren’t at a family function. But I don’t. I was blessed with children who try so hard to be kind to each other. I was blessed with daughters who are best friends and never let anyone come between that. I was blessed with a son with the most amazing sense of humor. I was blessed with a little boy who is determined in his unique hobbies and doesn’t stop until he’s mastered something. I was blessed to have a daughter who loves the Lord more than anything else and teaches me every day how to be a better person. I was blessed with a son who gives the best hugs, even though he’s almost a teenager. I was blessed with a son who rarely says “I love you” but when he does, my heart completely melts. I was blessed with children who are beautiful, funny, witty, smart, spiritual … my list could go on! Don’t you love that! Yes, my children have problems, but that doesn’t mean I can’t be the mother that I always dreamed of being. It doesn’t mean that I have to be upset or sad because they have unique issues. No! I can still be perfectly happy! When her teenage son started questioning his beliefs, one mother became overwhelmed with feelings of guilt and failure. While thinking of how she could have parented differently, she received a merciful impression: “He is not only your child. 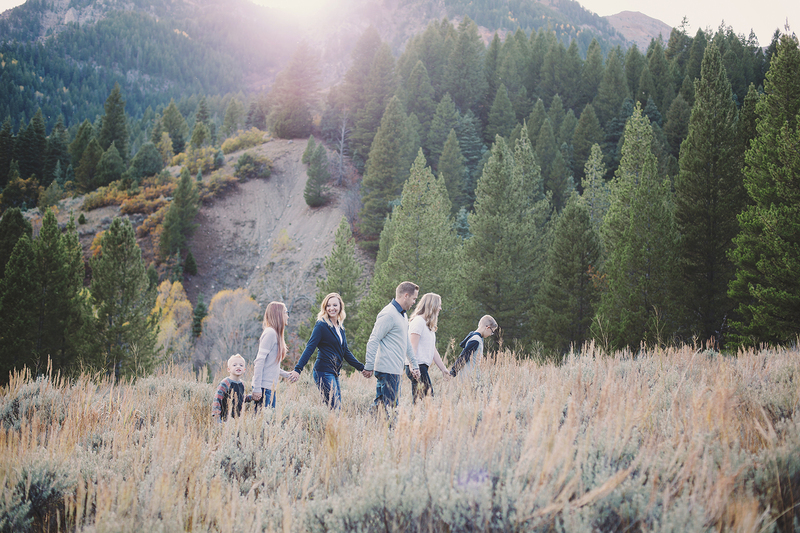 I love him even more than you, and I’m not feeling guilty about him or any of my other wandering children.” From that moment on, this mother was able to let go of the guilt and focus instead on what a lovely child of God her son was. Even though I don’t have a child who has left the church, I can relate to this mother of having feelings of guilt and failure. It’s through the grace of God and letting him lift my burdens that I can learn to be perfectly happy. They are His children too, and He loves them even more than I do. He entrusted me to be their mother and Heavenly Father never makes any mistakes. 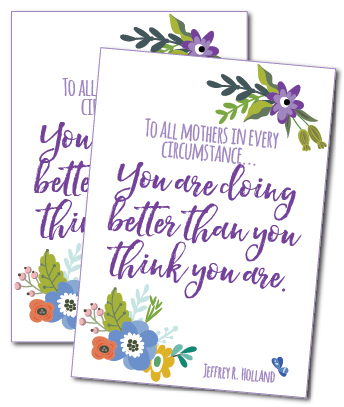 To remind me that I'm doing ok as a mother, I created this 5"x7" printable with the beautiful quote from Elder Holland's talk "Behold Thy Mother". 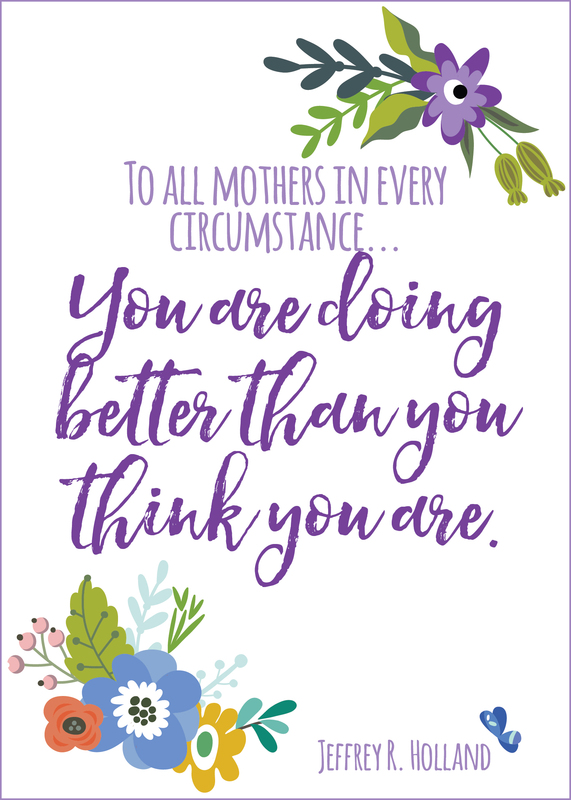 Feel free to print and use in your own homes or as a gift to a mother in your life that needs this gentle reminder! 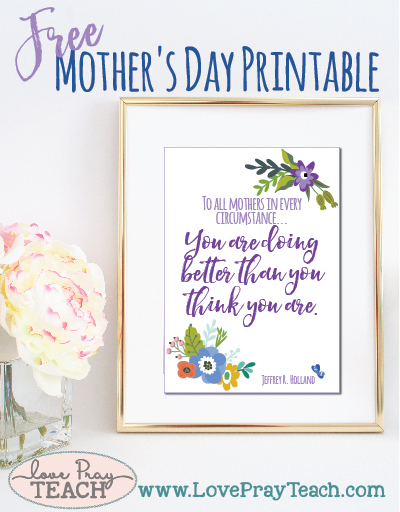 Mother's Day Crafts for the LDS Primary Classrooms! Gordon B. Hinckley Chapter 11: "Home—the Basis of a Righteous Life"
Father's Day Crafts for the LDS Primary Classroom!